You might be wondering what i have been working on all those days. 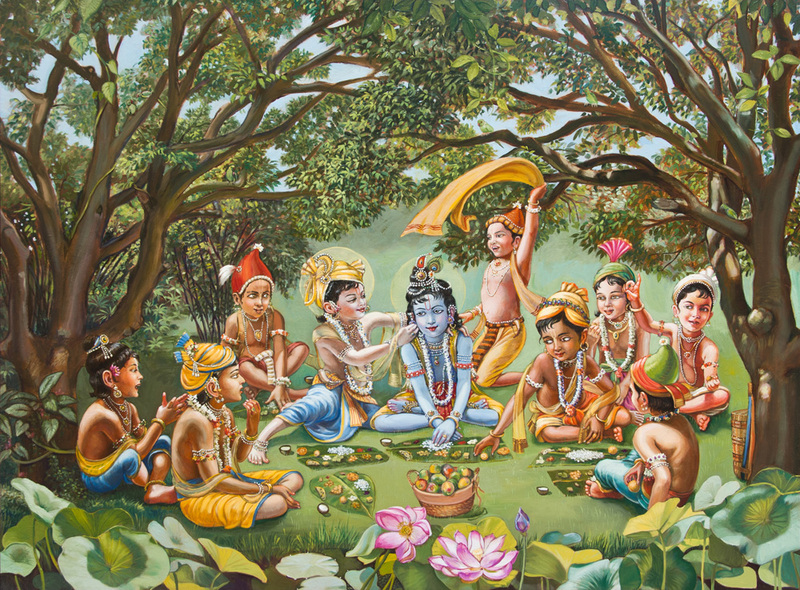 For the past 2, 3 months, I have been painting new illustrations for the publishing of the Bhagavad Gita. The paintings are quite large and demand a lot of preparation. Many sketches have gone into creating the art. It took me some 3 weeks to work on the Parta-Sarathi sketch. Those are not copies evidently and had to be design from the descriptions in the book. The Bhagavad Gita litterally mean the song of God; the song ( Gita) of Bhagavan ( Bhagavad). 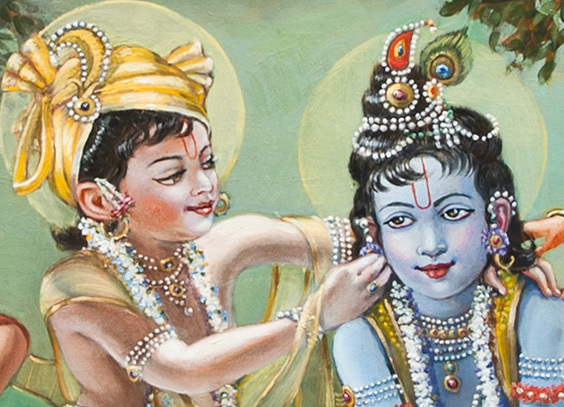 The Bhagavad Gita is a small part ( the heart ) of the larger work called "The Mahabharatha", an epic who would put homer's illade and odyssey to shame. This epic counts 100,000 verses! Yes you read correctly: 100,000 verses. It was a pleasure for me to illustrate this Bhagavad Gita with the new commentaries of Sripad Narasingha Swami. Now the original work will also adorn the monastery in south India. If you like to see the paintings, i am including a link for you to see them. They are not published yet, so I protected them with a large copyright sign across the work. Soon after publication, I will post those pieces in this blog. 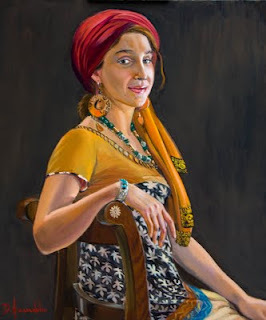 Dominique Amendola - California - French, classical realism spiritual art. ©This image is under strict copyright to Dominique Amendola and may not be reproduced in any form. To see a larger picture, click on the image. There are places were the farmer's market goes on year around. The choice of vegetables is restricted but at least it is in season. In this painting i combined 2 sketches together to make an interesting scene. The woman is anxiously looking at the man's fumbling for his change. 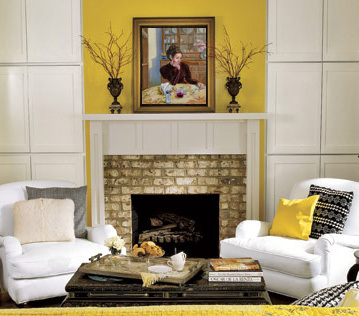 Some attractive yellow orange pumpkins on the side resonate with the man's bright yellow jacket. The purple jacket of the other man offers a contrast like a vibration in the middle of a symphony. The background is non descript with a few shadows milling around. The merchant has his back to us and is just a looming figure with no face. This is the art of creating an interesting scene out of a very ordinary setting. Everything is very colorful. The style is impressionism. This is not a print but this is an original painting. All my paintings are oil painting on canvas or sometimes on wood. This artwork is painted with museum quality art supplies and will last several 100 years. I've sold over 200 of my original paintings online, so you can buy with confidence. I do this for a living!! Your art will be shipped to you professionally packed with protective packaging material and wrapped in cardboard, then placed in a heavy-duty box for shipping. All items will be sent via USPS and insured. Original canvas size: 11"x 14"
You can purchase this painting through PayPal by contacting the artist, with many different options, such as credit cards or even through your bank. Oil on a large canvas 64" x 50". 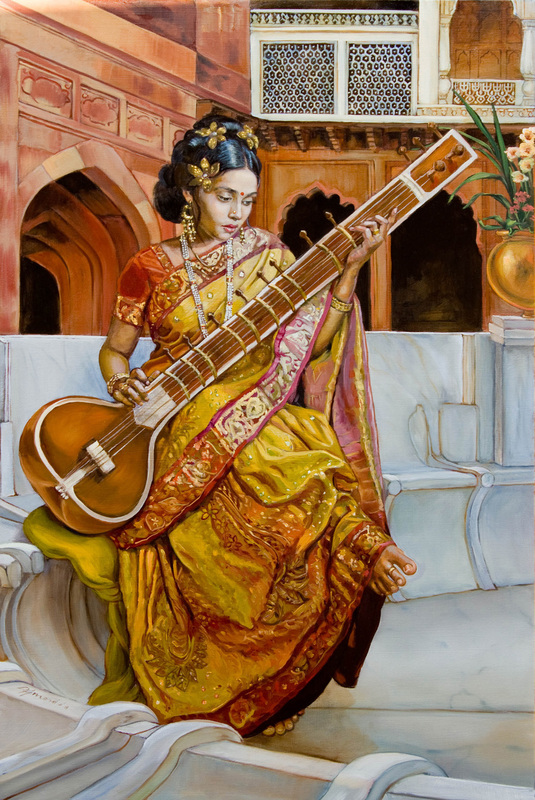 This is a commissioned painting for an Indian monastery. The original art is sold. 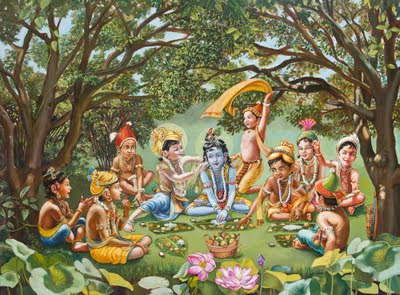 Original oil on canvas, size 64" x 50"
In the traditional lore of old india Krishna is a little cowherd boy with many friends who wanders the forest of Vrindavan tending his cows from sunrise to sunset. I have many paintings hanging in private museums in the US as well as in castles in France and monasteries in India. I have been published countless times by Bhaktivedanta Book trust and mandala media and in several other magazines and publications. To see a larger picture, click on the image. This painting has been sold at the Time and space gallery. 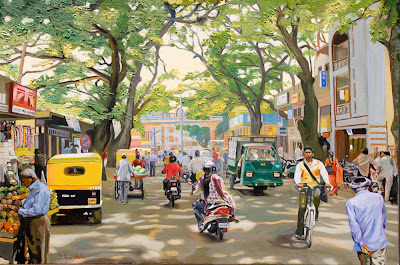 A typical street scene in South india, with pedestrians, cars, fruits vendors, rickshaws, motocyles, bicycles, the heat, the sun. Actually everybody is so patient. Any Europeans or Americans, would easily loose their tempers a hundred times over. 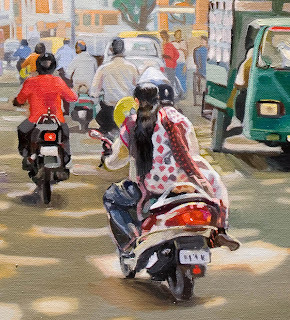 But here in india, there is no road rages, insults exchanges from one driver to the next, or even pedestrians to drivers. 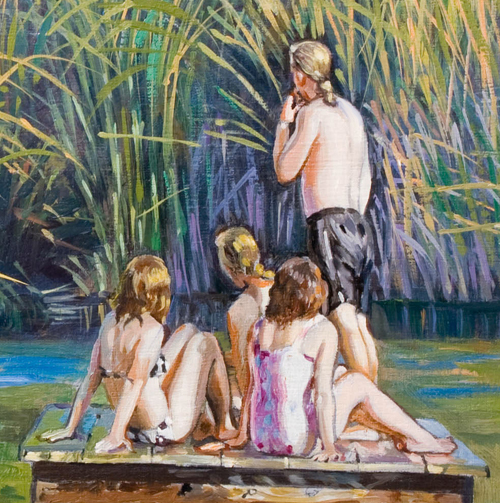 The style is impressionist, the technique is worked both with a brush or a palette knife. This is not a print but this is an original painting. All my paintings are oil painting on canvas or sometimes on wood. 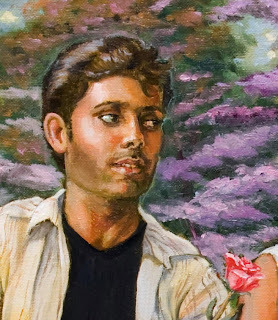 This artwork is painted with museum quality art supplies and will last several 100 years. I've sold over 200 of my original paintings online, so you can buy with confidence. I do this for a living!! Your art will be shipped to you professionally packed with protective packaging material and wrapped in cardboard, then placed in a heavy-duty box for shipping. This item will be sent via Fedex and insured. the shipping cost is included in the price. 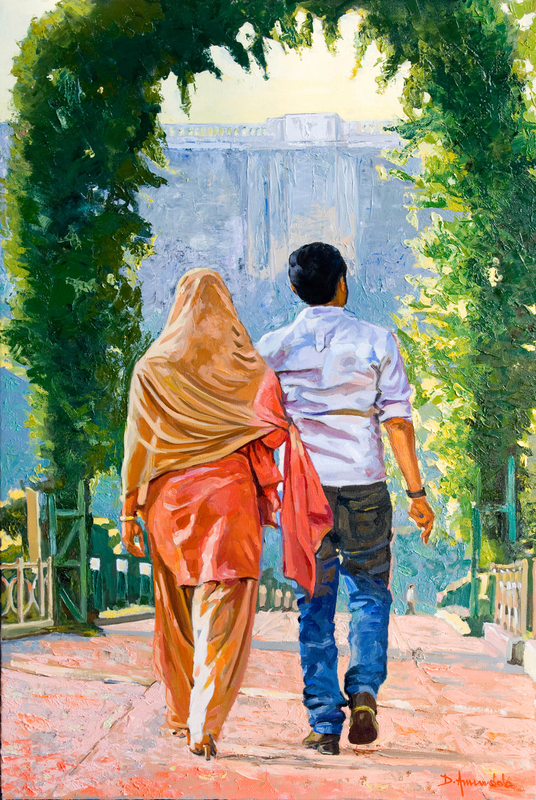 Original canvas size: 24"x 36"
An indian couple is walking in a garden under a huge leafy arch. The style is impressionist. 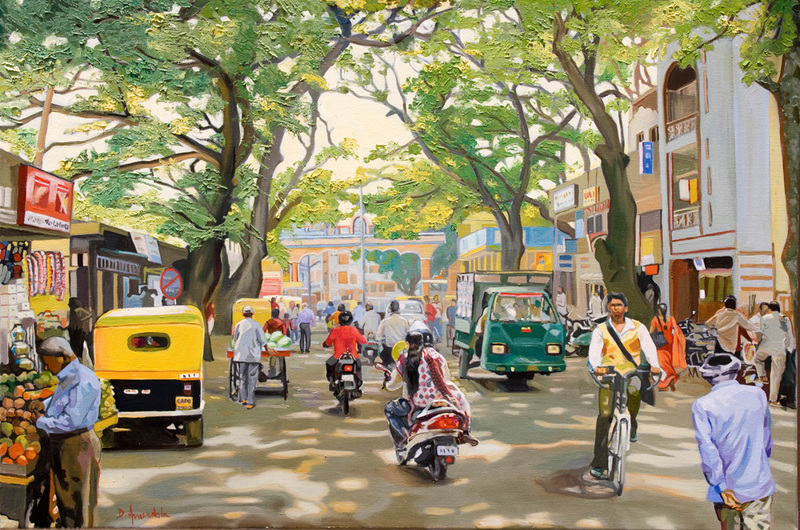 This painting has been executed in India. The place is Vrindavan Gardens in Mysore. 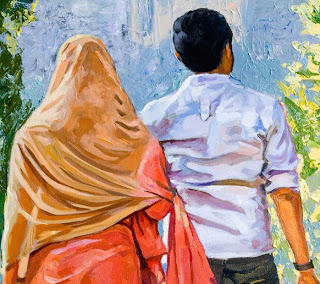 This is an oil painting on canvas. 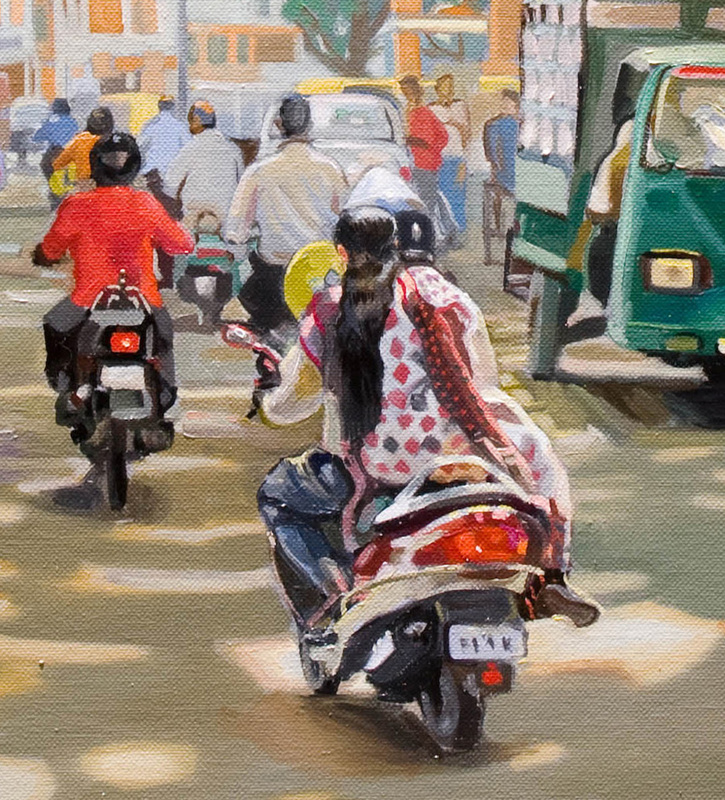 This piece was commissioned from me by a gallery in India. However, you can also buy this painting directly from the artist through Paypal. A young girl is sitting in a palace courtyard in Jayapura. This style is very kitsch and not exactly in the line of my usual work. This was however a very beloved style in the 19th century. This very style is experiencing a revival in US. Size: 24" x 36"x 2.5" with painted sides. Several figures on a swimming platform in the middle of the river waving at another figure rowing a boat. There is tall grass on the opposite river bank. The composition is classical, the colors vivid, the landscape with its long grass and water is refreshing, the figures are attractive and well proportioned. Buying contemporary and original works of art can make your world a better place. Art can enhance you home or working environment and it can help support an artist’s career. The best reason for buying art should simply be because you like it, and - like buying anything else of quality – it is worth trying to buy the best you can even if it means stretching your budget slightly, or paying in instalments. Buy works you genuinely like. Before you buy, ask yourself: “Will I regret buying it? Do I want many varied works or a few very distinctive pieces? Will it fit the space I have in mind? Evidently it might be a good idea to research the price range of the sort of work that you like and fix your budget. Buying directly from an artist is very different than buying from dealers. It usually means you get a better deal since you do not go through a third party and you get to ask questions directly from the artist about his or her work. The first thing is to make sure the art is original, not a copy of somebody else’s work.The fine art marketplace is complicated and hard to understand if you don't know your way around. It's full of products that look and sound like original art, but are actually reproductions, and no more original than newspaper or magazine illustrations. Ask the artist if his or her work is original. Get informed and learn about art culture, go the museum. 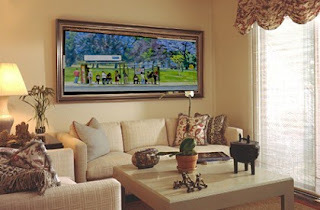 In this blog you are offered original paintings on canvas or wood by the artist Dominique Amendola. All the paintings presented are originals created by the artist. Buying Art Over the Internet is easy to do and the latest fad. Buying art with a keyboard and mouse is the new frontier of collecting. Learn basic facts about how online art buying works, how it differs from buying art in traditional ways, and how to progress from looking at art for sale to locating art you like and considering specific pieces for possible purchase. The more extensive the artist's online profile, the better. Yes, the artist's website is important, but equally important are third-party websites that review the artist's work, feature the artist, offer the art for sale, and so on. A quick word about bargaining. Suppose for some reason that you still want the painting after all's said and done, but would rather pay a little less for it. Art prices are often flexible and making an offer is certainly an option, but don't bargain purely the sake of sport. Make sure that you have a good reason for wanting a better price and that you can make a case for your request. Experienced collectors do this all the time. They know that artists are much more likely to reduce prices based on good solid arguments than they are to lower prices just because buyers want better deals. This image is under strict copyright to Dominique Amendola and may not be reproduced in any form. In an idyllic place, a couple is sitting on a bench. The background is dream like, reflecting their emotions. Everything is happy and colorful and voluptuous in a classical theme. The couple is Indian and that is what is unusual, however the style remains classical especially the composition. This is not a print. You are buying an original painting on canvas, all my paintings are canvas paintings. This art work is painted with museum quality art supplies and will last several 100 years. Your art will be shipped to you professionally packed with protective packaging material and wrapped in cardboard, then placed in a heavy-duty box for shipping. This item will be sent via Fedex and insured. Original oil on canvas, with painted sides, no need for a frame. Original canvas size: 24" x 36"
You can also purchase this painting through PayPal by contacting the artist, with many different options, such as credit cards or even through your bank.